We believe every couple should have a way to cherish their photography investment beyond the "cloud." While the digital age has afforded us many ways to view and store photos, an album allows for a unique and tangible way to display your images in real life. Our albums come with lifetime guarantees and are truly a piece of art for your home. We have partnered with an exclusive album producer who only works with 100 studios in the country. Not only does this mean high-quality craftsmanship, but a unique work of art for your home. With high quality Italian leathers, your album will not only stand the test of time, but be the envy of everyone who browses it. We offer seven colors in both classic and distressed styles. Don’t forget mom and/or dad! We offer stunning replicas of your wedding album in smaller sizes for a wonderful keepsake for your parents or grandparents. Each album is custom-designed, with love of course, by us. During the editing process, we are hand selecting the best images and layouts that tell the story of your wedding day. Our online gallery allows you to pick your favorites which we always try to incorporate into your final design. 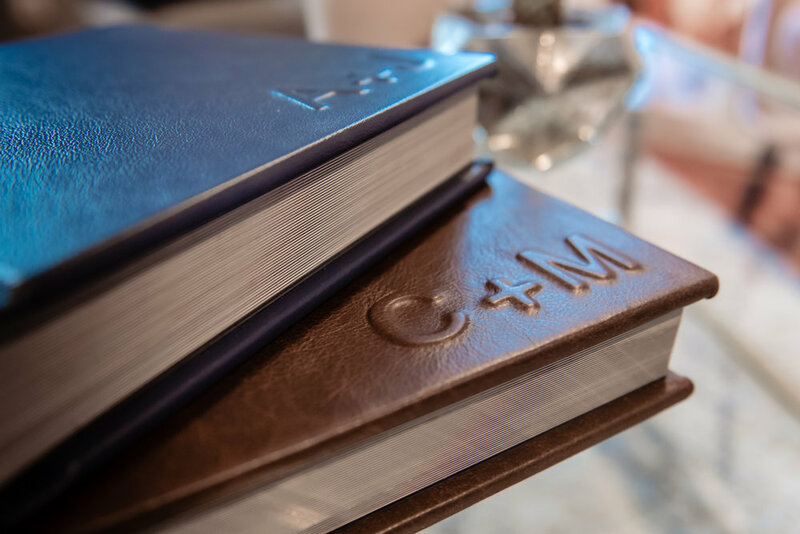 You also can choose many ways to display your names, wedding date or initials on your cover. Once your album proof is ready, we sit down and review the layout and images together. Upon your final album being received, we ship or hand-deliver your final book with the utmost TLC. Blank walls? New house? Time to replace that Beyonce poster from college? Whatever style you have in your house, wedding images always make a beautiful addition to your home. We offer a variety of choices: canvases metal prints and loose prints, in a variety of sizes and mounting options.